On Tuesday, Fayette County resident Paula Stepter cast her ballot for the general election early at the local Board of Elections office. Early voting workers at the Fayette County Board of Elections are encouraging registered voters to vote early in the general election. Pictured from left to right are: Merilyn Long, Marie Fetters, Leslie Meadows and Lisa Kiger. As of early Tuesday afternoon, 587 registered voters from Fayette County cast their ballots early in the general election, which will be held Nov. 7. There are still several opportunities for early in-person voting at the local board of elections office, 135 S. Main St. in Washington Court House. From today until Friday, those interested can vote early from 8 a.m. to 7 p.m.; 8 a.m. to 4 p.m. Saturday; 1 to 5 p.m. Sunday; and 8 a.m. to 2 p.m. on Monday. The polls will be open on Election Day, Tuesday, Nov. 7, from 6:30 a.m. to 7:30 p.m.
Absentee voting by mail and in-person began on Oct. 11. The local board of elections also reminded voters in the City of Washington Court House 1B and 1C precincts that the polling location will move from the Masonic Lodge to the rear of the Washington fire station. Any polling questions should be directed to the board of elections, 740-335-1190. Washington C.H. Municipal Court Judge Victor Pontious is facing local attorney, Steve Eckstein. In the Washington C.H. City Council race, five individuals are running for four open slots: incumbents Ted Hawk, Dale Lynch and Kimberlee Bonnell are running for another term and they will be challenged by newcomers, Caleb Johnson and Stephen Shiltz. Current city council member Leah Foster will not run for another term and is instead running for a seat on the Washington C.H. City Schools Board of Education. Two will be elected to the school board from a group of five: Foster, incumbent and current board president Ken Upthegrove, Donald Branham, Mark Chrisman and John Minyo. In Jasper Township, two will be elected from the following three candidates: incumbents Glenn Rankin and Jackie Pursley, and newcomer Chessie Ratliff. In Wayne Township, current trustees Marie Fetters and Ron Weade are not seeking another term. Two will be elected as Wayne Township Trustees from the following three candidates: Kyle Hoppes, Jarrod Posey and Bob Redman. – Fayette County Board of Developmental Disabilities will have a 10-year, 1.75-mill renewal levy for operations, services and acquisitions up for passage in all 25 precincts. – Also in all 25 precincts, the Fayette County Board of Health has a five-year, .5-mill renewal levy for program expenses and services up for passage. – In Wayne Township (one precinct), there will be a fire service renewal levy for five years and 1.5 mills. – The Village of Bloomingburg (one precinct) will have a five-year, 2.8-mill renewal levy for operating expenses. – Perry Township (one precinct) will have a five-year, 1.5-mill renewal levy for fire service. – Paint Township (one precinct) will have a five-year, 1-mill cemetery renewal levy up for passage. 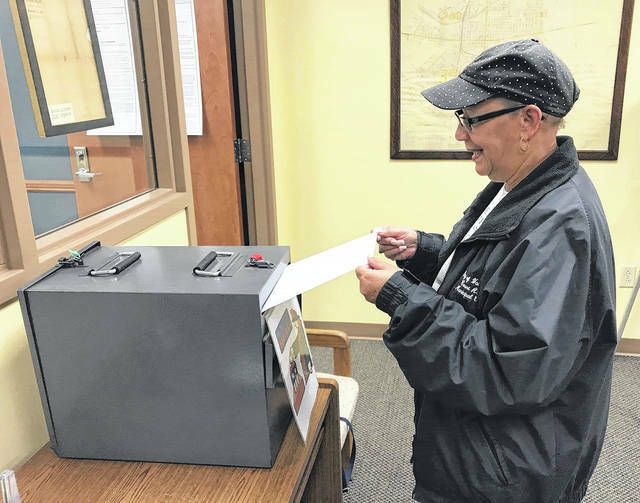 https://www.recordherald.com/wp-content/uploads/sites/27/2017/10/web1_Casting-a-ballot.jpgOn Tuesday, Fayette County resident Paula Stepter cast her ballot for the general election early at the local Board of Elections office. 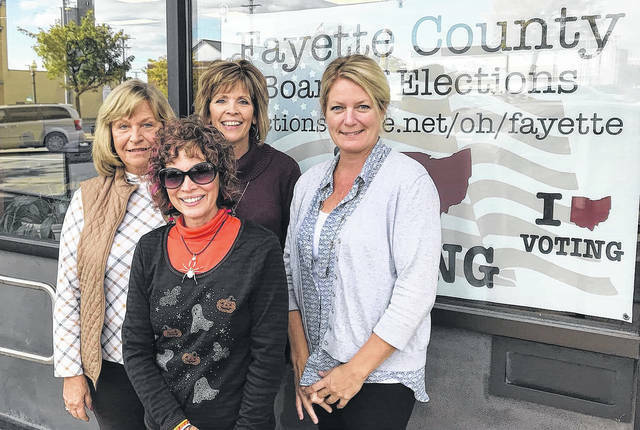 https://www.recordherald.com/wp-content/uploads/sites/27/2017/10/web1_Marie-Fetters-and-friends.jpgEarly voting workers at the Fayette County Board of Elections are encouraging registered voters to vote early in the general election. Pictured from left to right are: Merilyn Long, Marie Fetters, Leslie Meadows and Lisa Kiger.